Our main sources of income for Le Chéile Park are the annual Big Breakfast and this year we were fortunate to have a one-hour leisure flight sponsored, which we raffled locally. The other main source of income is the Donation Box at the park itself. Weekly income amounts in the box are published in the Church newsletter and the weekly newspaper Askamore Notes. The annual costs are made up of the remaining debt (approx €20,000 over the next 5 years) and the maintenance, insurance and various upkeep costs. We will update the barometer on a monthly basis both on the actual barometer and on the website. 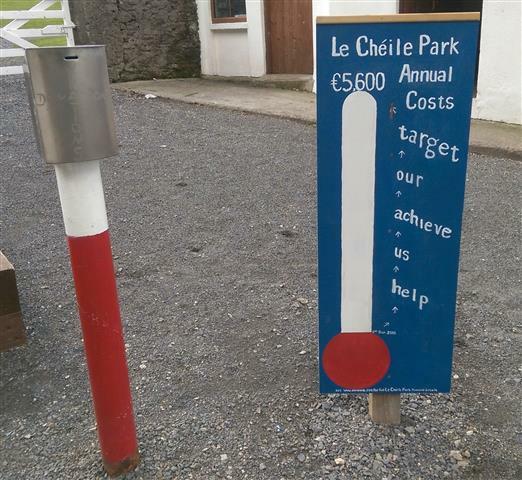 The idea to put up the barometer came from a suggestion from a member of the community so that people could see exactly what was involved in park finances. This entry was posted in Community Council, General, Le Cheile Park by admin. Bookmark the permalink.